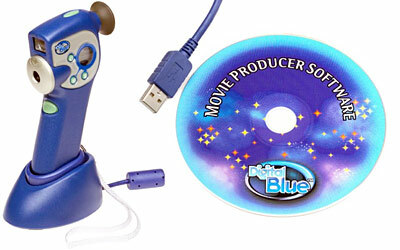 Get ready to make your own movies with the Digital Blue Movie Creator and your PC. This exciting movie camera lets you direct and record, capturing digital video and audio at or away from your computer; edit your movies with the included software doing cool transitions between scenes; add special effects and animations, plus titles and credits; premiere and share your movies, screening them on your computer or sending them in e-mails; and take hundreds of snapshots like a digital camera, even create stop-motion animated movies. Start making your own movies. Even star in them. Then turn your computer into a digital video editing suite.